OCEARCH is an open-source research initiative that gathers previously unattainable data on the oceans apex predators while delivering transformative K-12 teaching tools for science, technology, engineering and math (STEM). The non-profit was founded by Chris Fischer, who has led 20 global expeditions on the OCEARCH research vessel since 2007. His goal is to help governments and scientific institutions generate groundbreaking data and massively widen access to it – so it’s equally available to members of the general public as to PhD students and scientific experts. The future of the ocean depends on a healthy apex predator population, which requires a clear understanding of their migratory patterns, breeding and birthing habits and other key biological behaviors. Large animals such as mature white sharks and tiger sharks, prior to the availability of the MV OCEARCH and crew, were excluded from large-scale scientific studies because capturing and releasing them to attach satellite telemetry devices (tags) was not possible. These animals are key to the ocean ecosystem due to their role as apex predators and their extensive range. 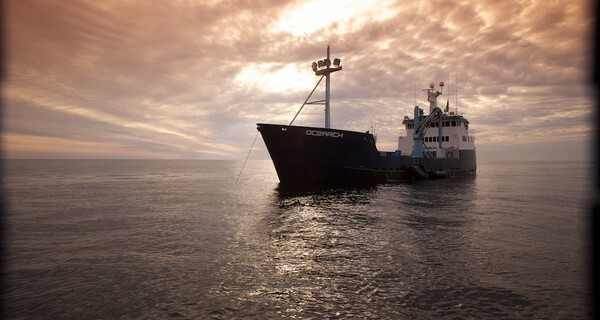 The OCEARCH ship is fitted with a pioneering custom research platform adapted to capture, tag, and release mature great white sharks - the top predator of the ocean food web, weighing up to 2,270 kilos or 357 stone each - as well as other species. In a 15-minute window, the researchers carry out approximately 12 studies, including tagging and sampling, before releasing the sharks back into the ocean. The findings are published in near real time at no cost via the Global Shark Tracker – the data shows shark biology, health, navigational patterns, migration, breeding areas, feeding zones and birthing sites: all vital data for informed conservation policy-making. The tracker has also been embedded in STEM lesson plans, ranging from geography to physics, also available for free at OCEARCH.org.